Before 1994 this was the most distinguished modern church in Crawley. The first church on the site was a modest brick one with vestigial gothic detail, which was built in 1934-35 to a design by M Gill and cost only £1491 (CDG 18 p341). This predated the expansion of Crawley new town and in the light of that was clearly considered insufficient. A replacement was built in 1952-54 to the design of N F Cachemaille-Day and Partners (ICBS/60 Churches p96) and is closely related to his exactly contemporary All Saints, Hanworth in Hounslow. Both designs show distinct continental influence, in architecture and liturgy. A flat-roofed glazed rotunda, perhaps unconsciously echoing Erik Gunnar Asplund’s (1885-1940) Stockholm Town Hall of 1921-28, surmounts a cube-shaped main part and the influence of the French architect Auguste Perret (1874-1964) is also apparent. Inside, St Richard was the only church in Crawley with a central altar. A hall to the north could be opened into the church, but a planned east extension was never built. 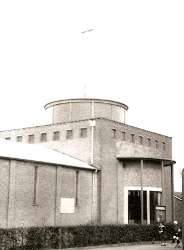 After the church was found to be in a poor state structurally and since its size had proved to be excessive when compared with the needs of the parish, it was declared redundant in 1993 and subsequently demolished. A more modest church with the same dedication, but on a different site in Gales Drive, was built in 1995-96, to the design of G Claridge (C20 Society Churches Database). It is faced both inside and out with red brick and has steep pitched roofs.